The HOBO Waterproof Shuttle provides convenient readout and relaunching of underwater and outdoor HOBO loggers with an Optic USB interface, and is waterproof to 20m (66ft). The HOBO Waterproof Shuttle can also be used as a base station. 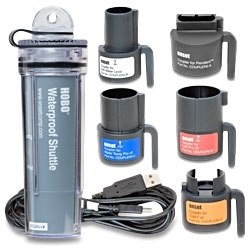 NOTE: Couplers are included for compatibility with five of our most popular logger types including: UA Pendants, U20 water level loggers, the U22 Water Temp Pro v2, our UTBI TidbiT, U24 Conductivity and U23 loggers. NOTE: HOBOware Pro software required. See Required Software tab above. 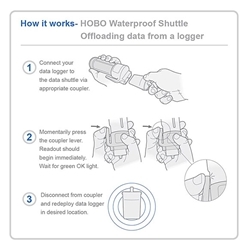 Onset offers a range of data retrieval and communications options to make data offload from HOBO loggers fast and easy. Learn about this data shuttle's outdoor and underwater applications using optical communication. Data can be offloaded when wet or fully submerged under water. Instructions are given for offloading data to shuttle using a coupler and then how to offload stored data to a PC or Mac. Data from from 63 shuttles can be offloaded onto one shuttle. 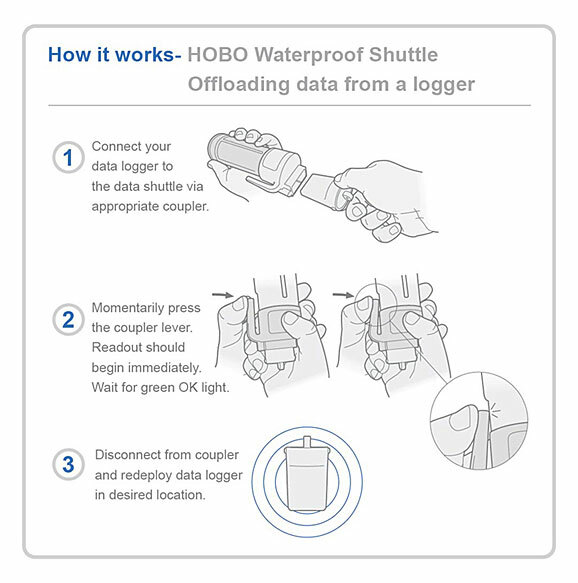 Compatibility: All HOBO U-Series loggers with optic USB. 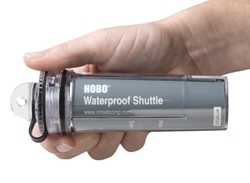 Not compatible with the HOBO U-Shuttle (U-DT-1).